Best Sound Can Make You More Romantic! The Fugoo Style offers competitors a run for their money. Boasting some serious features and most importantly great sound. We would count the Fugoo Style as the Best Bluetooth Speaker overall in 2017. so far. Let’s Read Fugoo Style Speaker Review. This awesome Bluetooth Speaker is called the Fugoo Style for a reason, an aesthetically pleasing Jacket that wraps the body of the speaker has a great feel to and look to it. The Fugoo comes in three different variations of these jackets.Style, sport and tough. We are reviewing the style version. If you want to purchase the other two jackets they sell for $90-$120 each. The fugoo style is relatively small speaker. 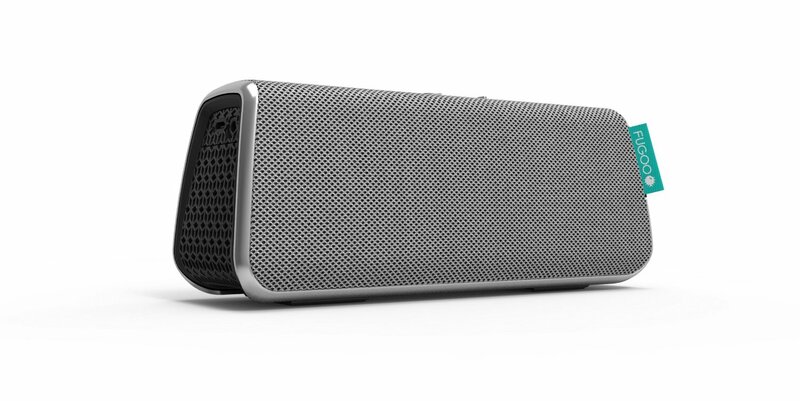 At 7.4 x 2.9 x 2.3 inches its somewhat similar in size as the Bose Soundlink Mini but it is lighter at 1.1 pounds vs boses 1.5 pounds. The internals of the Fugoo are packed with two tweeters for treble, two mid/woofers for the midrange and bass tones, and two passive radiators for additional low-end frequencies. The battery life on the Fugoo is an incredible 40 hours which is what you wanna see when you consider a Bluetooth Speaker. The design aspect of the Fugoo call for only the essentials. You will find Volume buttons on the top, on the side you will find the power button and a Bluetooth pairing button and the other side comes with a microUSB port and a 3.5mm aux input if you decide to connect a device without Bluetooth. The Fugoo Style can be used anywhere. The Fugoo boasts some serious toughness with an IPX rating of 67, the speaker is dust proof and water proof with some limitations as you can only hold the device under one meter deep water for about 30 minutes before the speaker dies out. we dont recommend swimming with the speaker because we believe the waterproof features are more intended for accidents rather than diving into the pool with the Fugoo. The waterproof features are great to have especially if you are active outdoors. If you need some extra toughness, if you work construction for instance you can purchase the Tough Jacket for the Fugoo. So far we have an excellent design, rugged body and lots of features now lets check out the sound department. You will fall in love with the Fugoo from the first time you hit the play button. The Fugoo has a balanced sound, excellent highs and lows, deep warm bass and superb clarity. Sound is spread equally thanks to the great balanced design so you dont have to sit directly in front of the speaker. Along with great sound you also have a great speakerphone that can be linked with Siri and Google Voice. Speakerphone Quality is excellent. Fugoo claims to have a range of up to 33 feet which was tested and confirmed. The competition starts to loose connection at about 15 feet. So there you have it, the Fugoo Style has a great design, top notch sound quality, 40 hour battery life that surpasses all competitors and all bundled up in a solid waterproof rugged shell. At $200 it really does blow the competition right out of the water. Fugoo’s portable Bluetooth speaker bests the competition in all the areas that matter: ruggedness, battery life and sound quality. Disclosure: SoundChoose.com is a participant in the Amazon Services LLC Associates Program, an affiliate advertising program designed to provide a means for website owners to earn advertising fees by advertising and linking to Amazon (.com, .co.uk, .ca etc) and any other website that may be affiliated with Amazon Service LLC Associates Program. Copyright © 2019 SoundChoose.com - All Rights Reserved.